Siam Sterling Nielloware Bracelet Bangle. Only Black & Silver pieces are considered to be Nielloware. Siam Sterling Jewellery manufacture dates back to the 1930's. Computers & Gaming. The Bracelet weighs 38.49g & the Brooch 7.32g. Handcrafted, you can see the fine filigree works.Look at. the filigree scalloping on the rims, how beautiful. MAIN STONE SHAPE marquise CUT. MAIN STONE sapphire. OTHER GEMS WHITE TOPAZ. RING SIZE 6.25. MAIN STONE Citrine. OTHER GEMS Citrine. COATING White Gold Coated. PRODUCT TYPE Sets. Natural Baltic amber bracelet and necklace set. Both necklace and bracelet are made of natural Baltic amber beads in cognac, bronze and citrus colours in combination with genuine turquoise. Amber and turquoise beads are placed on very resistant steel line, and are separated of each other by sterling silver (.925) separators. An elegant, simple sterling silver clasp is not only easy to use, but is also perfect, stylish supplement of this beautiful jewellery. Perfect combination of the simplicity of amber and modern elegance of turquoise! . A new handmade pearl pendant fixed to a Sterling silver chain with matching Sterling silver hook drop earrings. 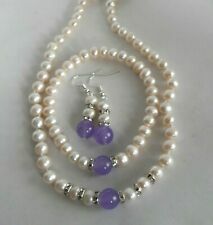 Unusual necklace & earring set handmade with cultured freshwater button pearls. The necklace is adjustable from 16 - 20 " long with 925 Sterling Silver chain. It can therefore be worn more like a choker or as a normal length necklace. double Freshwater pearl drop earrings with diamante rondelles on Sterling Silver ball studs. and the matching bracelet, the standard length is 7.5". Standard Necklace length: 17". By Designer Nancy Laverge. Standard length for necklace is 17". Handmade Freshwater pearl and clear diamante Sterling Silver necklace, bracelet and earrings bridal / bridesmaid / prom Designer jewellery set. Necklace: 6- 7mm high lustre AA ivory white Baroque freshwater pearls with sparkly touches of clear crystal set beads and a Sterling Silver toggle clasp. Classic Sterling Silver teardrop AAA Cubic Zirconia necklace and earrings set. Earrings Length including Sterling Silver leverbacks : 1.25" (3.2 cm). Standard necklace length: 17" (Can be customised on request). White & bronze cultured pearl necklace & earring set on 925 S.S. Pretty & unusual cultured pearl adjustable necklace & earring set on 925 Sterling Silver. The earrings are on 925 Sterling Silver fancy earring studs. This is a wonderfully colourful bespoke matching jewellery set of sterling silver earrings and necklace. These gemstones are hand set in lovely sterling silver unique design in a bezel setting that showcases the gemstones perfectly! Handmade Designer Freshwater pearl and diamante. Freshwater pearl necklace, bracelet and earrings set. Necklace: 7mm high lustre ivory white freshwater pearls. Earrings: Pretty Sterling Silver ball stud earrings with 7mm high lustre freshwater pearls and Silver sparkly crystal balls, length: 2cms. Freshwater Pearl and crystal bridal / wedding/ bridesmaids special occasion necklace and earrings jewellery set. This Jewellery set is designed with. The necklace is finished with a Sterling Silver clasp and the earrings are on Sterling Silver hooks. Beautiful Real Lapis Lazuli Stone Leaf Design Set is handmade and coated 925 Sterling Silver. Lapis Lazuli is a rock of different minerals that can stimulate the rapid release of stress and energize the mind. ETERNITY RING WEIGHS 2.5 GRAMS AND IS 5 MM WIDE. TOTAL WEIGHT OF TRIO SET OF RINGS 5.8 GRAMS. This is a stunning faceted cut sparkling bespoke matching jewellery set of sterling silver earrings and necklace. The necklace & earrings are a gorgeous faceted cut sparkling 3mm x 3mm round Aquamarine (lab) gemstones. White Baroque Freshwater pearl necklace and earrings set. beautiful 7mm white Baroque Freshwater pearls wire wrapped in Sterling Silver. Baroque Pearl are irregular in shape and each pearl is individual. MaterialGenuine Untreated A Jadeite Jade. All project is the 100% Natural jadeite jade. Jade is not just a commodity, it is more of an art. All our jewelry pieces, from which we gain by our own carefully selected to create the original stone. This is a stunning faceted cut sparkling bespoke matching jewellery set of sterling silver earrings and necklace. The necklace and earrings a beautifully faceted cut sparkling 6mm x 6mm diamond shaped Cubic Zirconia gemstones. This is a magnificent faceted cut sparkling bespoke matching jewellery set of sterling silver earrings and necklace. The necklace is a gorgeous faceted cut sparkling 10mm x 8mm pear drop pink Sapphire (lab) gemstone, white the earrings are a stunning faceted cut sparkling 8mm x 6mm pear drop pink Sapphire (lab) gemstones. The fastenings are good quality - I'm sure that they are silver plated at least. Handmade from freshwater pearls in a beautiful crimson pink colour. A lovely versatile and different take on a set of pearls. This necklace is made with royal blue & white cultured pearls. There are tiny white cultured pearls between the blue pearls. The necklace is adjustable from 16 - 20 " long, it can therefore be worn choker style or as a normal length necklace. With Freshwater pearls and diamante crystal balls. Sterling Silver pearl and Diamante bridal / bridesmaids / prom or special occasion necklace and earrings set. Fine Sterling Silver necklace and earrings set. Beautiful genuine pearl and jade jewellery set. Pearl and jade necklace and matching bracelet. This is a stunning faceted cut sparkling bespoke matching jewellery set of sterling silver earrings and necklace. These gemstones are hand set in sterling silver in a claw bezel setting. Elegant Bridal or bridesmaids illusion necklace, bracelet and earrings SET. Pearl bridal / wedding/ special occasion / bridesmaids/ prom Communion or Confirmation jewellery. The bracelet and necklace are finished with a Sterling Silver clasp and the earrings are on Sterling Silver ball studs. NAVAJO Solid Sterling Silver Turquoise Pendant & Earrings. Solid sterling silver 21grams Navajo Natural Turquoise stones both Blue and Green colour. Bought from a reputable dealer of old Navajo jewellery. A chunky necklace and earring set in Fluorite gems. I have used smooth oval nuggets, 30-35 x 20-25mm, polished and shiny, alternating with rough, unpolished nuggets, 18 – 20mm – both in Fluorite. The earrings each have two sterling beads, two Quartz beads and a rough nugget, on substantial sterling silver wires. $WE ARE NOW OFFERING AN EASY PAYMENT OPTION ,WHERE YOU CAN MAKE 4 INDIVIDUAL PAYMENTS OVER THREE MONTHS , SEND US A MESSAGE IF YOU INTERESTED IN USING THIS FACILITY. Hand made Platinum diamond full eternity wedding band ring, with full uk london hallmark. This ring is made with the Traditional Techniques jewellers have been using for hundreds of years ,by skilled craftsmen in the hatton garden jewellery district in london. if you like you can make an appointment to come meet the craftsmen who will make your ring for you. We would be more than happy to show you the tools and craft in making a very personal one of a kind ring for you. our rings are microset by highly skilled master craftsmen. these rings can be made with smaller and larger diamonds to fit your budget. Certified Baltic Cognac Amber from Poland (see Authenticity certificate) and Hallmarked. 925 Sterling silver chain Handmade set in simple gift box. Earrings - Reflecting design of necklace pendant three Baltic Amber 5mm rounds on sterling silver hook drop earring wires. The colour of this Paraiba stone is a stunning natural neon blue, it has a deep beautiful cut, and wonderful internal reflection that is enhanced by it beautiful setting. You will not be disappointed. Sterling Silver and Freshwater pearl bridal jewellery set. The set will be presented in a pretty gift Box ready to give to a loved one. by Belgian Designer Nancy Laverge. This beautiful double stringed Necklace of Cultured Pearls with a Sterling Silver Barrel Clasp can be worn for any occasion. It features Grade AAA 5 mm - 5.5 mm cultured freshwater pearls to create a stunning, classic and stylish piece of jewellery for any occasion. UK FULL HALLMARK ON THIS HANDMADE 18CT GOLD PENDANT. THE TOP HAS A CONCEALED LOOP AT THE BACK TO THREAD A CHAIN THROUGH. IT IS ALSO SET WITH A GOOD QUALITY WHITE DIAMOND APPROX 2.5MM ACROSS.